The Food Alphabet and More: The 2014 Starbucks planners are here...Collect all 4! Be there at the kick-off party! 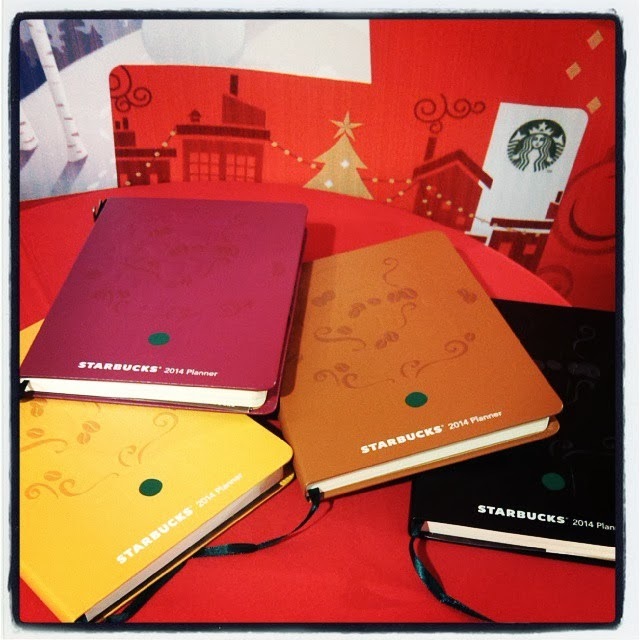 The 2014 Starbucks planners are here...Collect all 4! Be there at the kick-off party! 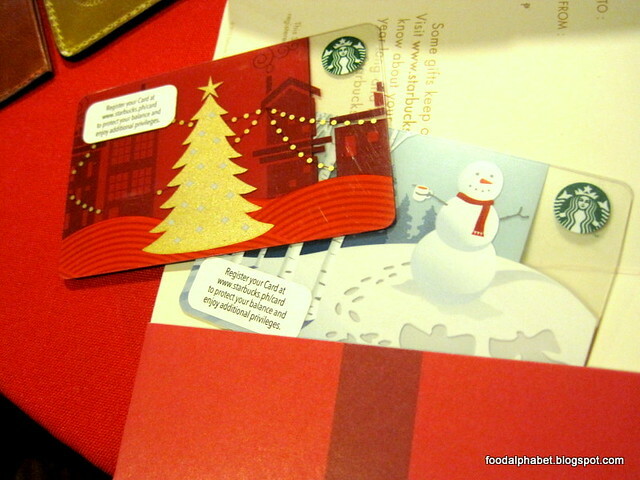 Every Christmas season, Starbucks Coffee Philippines brings to us the yearly tradition of the Starbucks planner, each year they give us a reason to celebrate the merry season of the year, giving hope, laughter and so much to aspire for. For the 11th edition of this unbelievable journey of the Starbucks Planner, the 2014 Starbucks Planner promises to give you more than just the planner experience, and lets you into the The Coffee Perfection theme which brings to us the journey to coffee perfection at Starbucks. The 2014 Starbucks Planner will be available for you starting November 2, 2013. So what has the 2014 Starbucks Planner have in store for us. 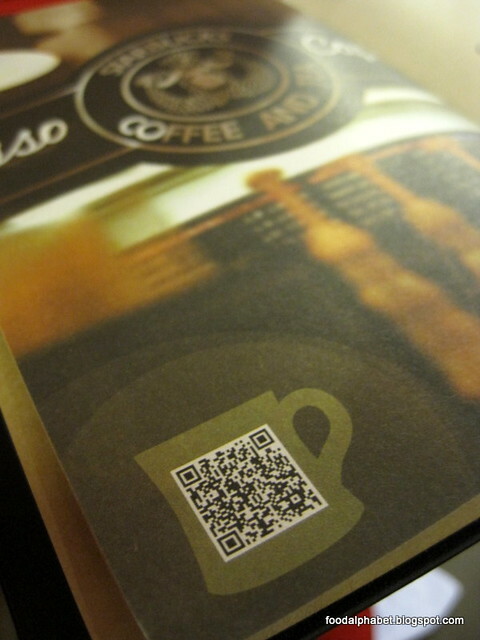 Spread throughout the planner are QR codes, which feature videos and show you how coffee has brought you the Starbucks Experience, scan on it and be enlightened. CLICK HERE TO SEE THE 2015 STARBUCKS PHILIPPINES PLANNERS! The 2014 Starbucks Planner comes in four (4) delightful colors, Yellow, Brown, Magenta and Black. Inspired by the colors of Starbucks coffee beans - Blond Roast (yellow), Medium Roast (Brown), Dark Roast (Magenta) and Starbucks Reserve Coffee (exotic, rare and exquisite). 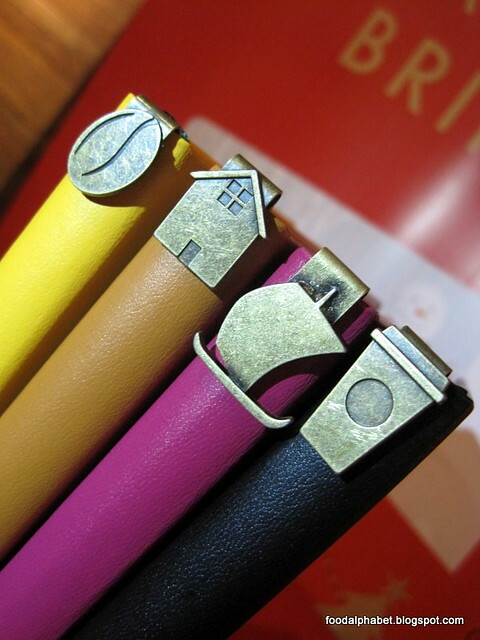 Each planner comes with a coffee icon bookmark, each unique for its color. The Coffee bean for the yellow, coffee house for the brown, sail boat for the magenta and coffee cup for the black. 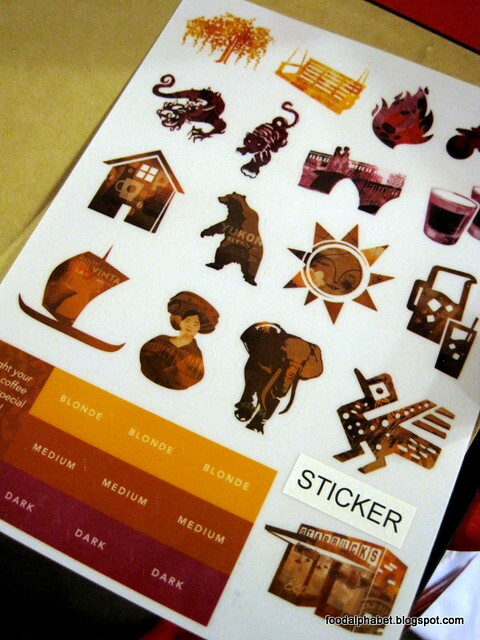 You can adorn your Starbucks 2014 planner with stickers. And enjoy the many coupons that you can use throughout the year, there are a total of 14 coupons you can use throughout the year. 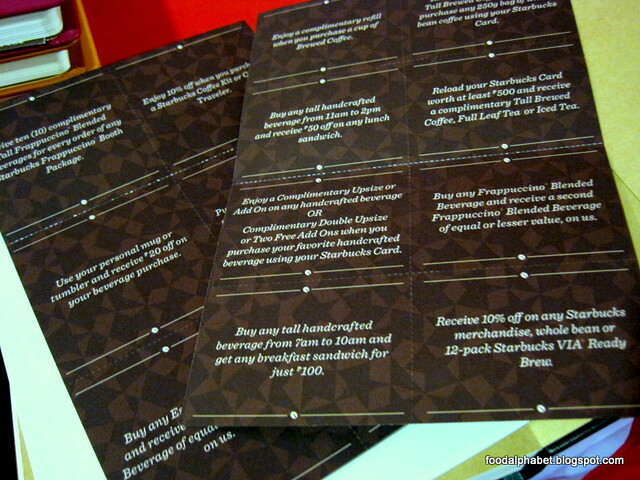 Ten (10) complimentary Tall Frappuccino Blended Beverages when you avail of a Starbucks Frappuccino Booth Package. 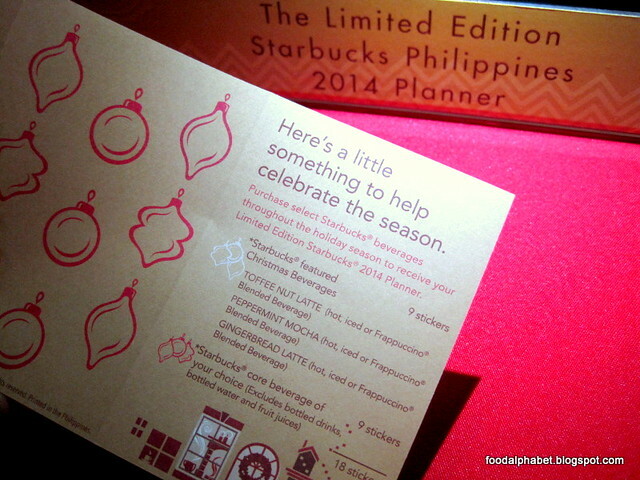 Now comes the important part, how to get your hands on The Limited Edition Starbucks Philippines 2014 Planner. Let me show you how! Load up your Starbucks card with P5,000 and you get a Starbucks Planner 2014 edition instantly! It's as easy as 1-2-3. Got the budget? Get one now! 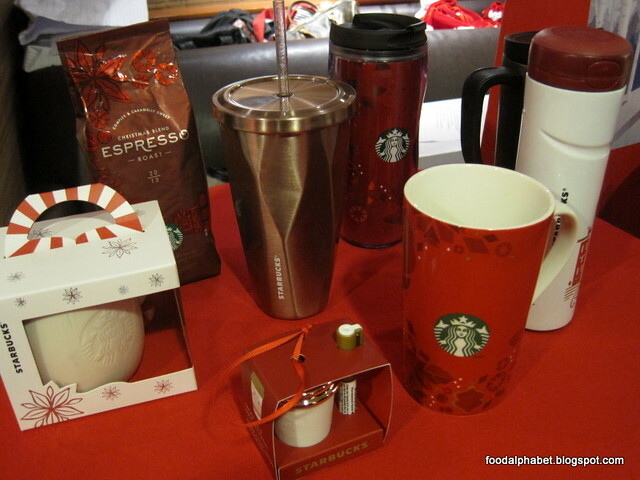 You just got to love Starbucks stuff, from their tumblers to their coffee beans, just purchase P5,000 worth of Starbucks stuff and you get a Starbucks Planner 2014 edition right there and then. There you have it! So many ways to get yourself that much loved Starbucks Planner 2014 edition. But of course since it's the season of giving, let us #SharetheJoy this Christmas! The Food Alphabet and Starbucks Philippines have prepared something for you my readers....watch out for it very soon here! But wait! 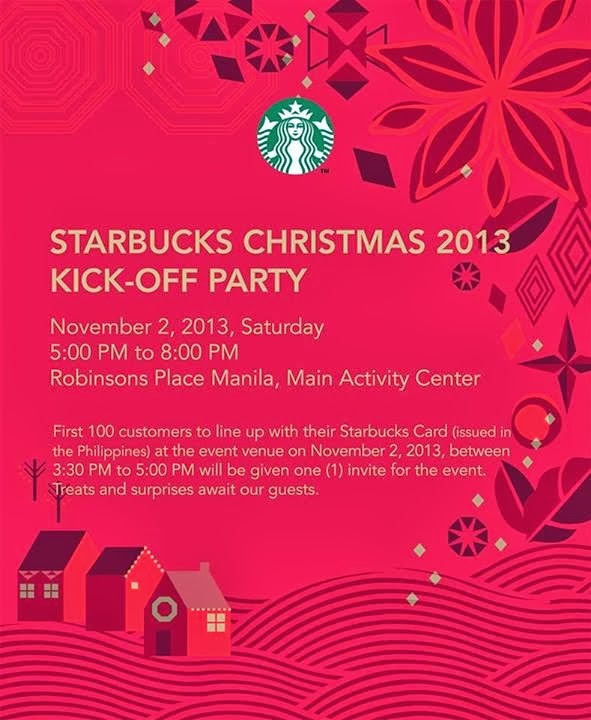 To celebrate the start of the 2014 Starbucks Planner promotion, Starbucks Philippines will have a Christmas 2013 kick-off party on November 2, Saturday at the Robinsons Place Manila, Main Activity Center. Get ready for games and excitement as we join in the celebration. 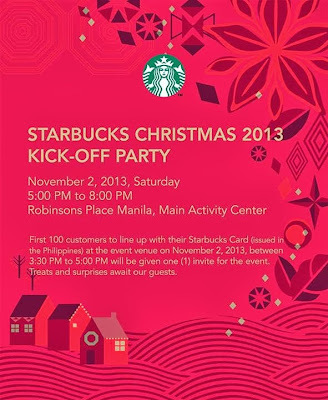 First 100 customers to line up with a locally issued Starbucks Card at the event venue, from 3:30 - 5:00 pm gets to have one (1) invite to the event. Let's create wonder and share joy with the Limited edition 2014 Starbucks Philippines Planner! And see you at the kick-off party! Check out the very simple yet classy starbucks planners from south korea! Available in the Manila from November 16 onwards! hi i have a question on getting the SB card holder I would appreciate if you can clarify this with SB management. If I purchase a new SB card from nov 4-6 and I load it with P5000.00 instead of P1,500.00 will I get to have the SB card holder and the planner or its not the case? thanks for the clarification. I got the planner nlng. since that's the whole purpose of the P5k load. more reasonable. appreciate your response. To get the planner with a 5,000 load, can you divide the load into several Starbucks cards or should it only be loaded to 1 card? It should be one card only. may starbucks na nagbebenta dito.. nakita nyo na? The best planner by far. Check my blogpost http://dblackbitch.blogspot.com and win the White Starbucks 2014 pen! hello, i am a foreigner,i really really really want to have a starbucks notebook ,but ,now it ends, i gonna to cry ,the notebook is very very very important to me ,i have no idea , i asked help from philippines friends and the worker in starbucks stores,they said no way ,what you can dou is waiting for next years,but i really really really want to get the notebook this year ,my English is poor ,hope you can understand my statement ,can you help me ,i can even pay for the notebook in a high price ,i just want to get a starbucks notebook!!! Damn, how much are these going for..?